My Silent Hero: A Bungendore Boy - James Wells Hopkins & The South African War (Boer War) 1899-1902. A Bungendore Boy - James Wells Hopkins & The South African War (Boer War) 1899-1902. At 10am on Wednesday, 31 May 2017, an important ceremony will be held at a memorial site on Anzac Parade in Canberra, our nation's capital. Anzac Parade holds a prominent place in the recording and commemoration of Australia's military history. It is here, on the approaches to the Australian War Memorial, that an impressive array of memorials have been constructed in honour of Australia's military campaigns and those units and individuals who served in them. Yet, our very first campaign has never had a memorial! This will be corrected on May 31 when a memorial to Australia's involvement in the South African War (or Boer War) will finally be unveiled. This event will be the culmination of many years of dedicated effort by the National Boer War Memorial Association (Australia) and a preview of the memorial may be seen here. In recognition of this event, it seems appropriate to honour the memory of one of the early participants in that conflict. James Wells Hopkins was born in Bungendore, NSW, just down the road from Canberra. He is a local lad and also a relative, being the much loved uncle of my paternal grandmother. I had no idea he had served in the Boer War until as recently as 2012. 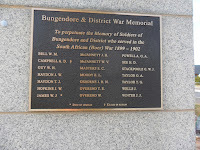 It was while assisting with a country football team that I spotted his name on the Bungendore War Memorial adjacent to the football field. 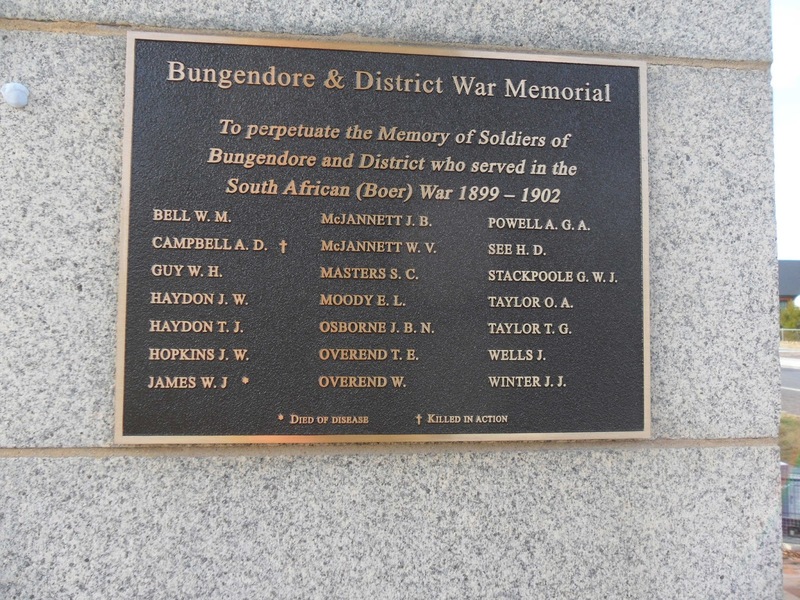 The Bungendore War Memorial committee commissioned an excellent document describing and honouring those local gentlemen who served in the South African campaign. The full document can be found here and I would recommend it those who would like a greater understanding of the times and the people. I have borrowed from this document to tell Hopkins' story. I do hope they don't mind. Born on 19 May 1876, the ninth of George and Elizabeth (née Sladen) Hopkins’ eleven children. He married Eva Gertrude Aspinall and they had three children, Doris, Elma and Frank. Later he married his cousin, Gladys Hopkins and they had two children. He volunteered for service on 1 November 1899 and was interviewed by Captain Antill. He enlisted as James Hopkins Private No. 43 in “A” Squadron NSW Mounted Rifles. The Queanbeyan Age 7 January 1900 reported that after returning to Sydney from South Africa James Hopkins along with Robert Swan, was given a big welcome reception at Byrnes’ Royal Hotel, Queanbeyan, by the people of Queanbeyan. He brought with him a Boer Mauser rifle which had belonged to Captain F.B. Wessels of Strachan’s Scouts who was later sentenced to death for shooting prisoners. On 1 June 1901, he joined a number of other men from the Queanbeyan-Braidwood region at Government House in Sydney to receive the Queen’s Medal with six Clasps from the Duke of York. He later re-enlisted with the 1st Battalion Australian Commonwealth Horse, leaving Sydney on 19 February 1902 as a Sergeant-Major for a second term of duty. At that time, he was twenty-four years and seven months, employed as a soldier and living at Victoria Barracks in Sydney. In that instance he nominated his father ,George Hopkins of Hoskinstown , as his next-of-kin. His Service Record indicated that he had previously served for 15 months in the 1st Mounted Rifles in South Africa. The AWM Nominal Roll for No. 54 records the name of James William Hopkins. NSW Births Deaths and Marriages records the death of James Wells Hopkins as 70273/1971, being the son of George Wells and Elizabeth A and was registered in Blacktown, Sydney. In this matter it is therefore assumed that the recording of Hopkins name as James William and not James Wells on the AWM Nominal Roll is incorrect. Notes: 1.It is suggested that James Hopkins is not the Hopkins J. commemorated on the Bungendore Great War Roll of Honour. 2. James Hopkins ‘ son, Stanley James by his second marriage, died in Thailand as a Prisoner-of-War during World War II. He is commemorated on the Bungendore Memorial Roll of Honour as Hopkins S.J. LETTERS FROM THE FRONT. PRIVATE J. HOPKINS. Mr. A. W. Daniel, of Hoskinstown, has re ceived a lengthy letter from Private James Hopkins, who took part in many of the leading events of the war. The particulars of the engagements have already been published. Private Hopkins was present at the attack by 5000 Mounted Infantry on about 1000 Boers who were holding the main pass to Magersfontein. The Boere were hid ing behind rocks on the hills, and the British had to advance across an open plain. A hot fire was poured into the attacking force, who were forced to lie down and get behind any bit of shelter they could find. The place where Private Hopkins was lying was as flat as a table, so he got his bayonet to work and in a short time had built a nice little breastwork. The day was very hot, and the men lay for six solid hours under fire. When they got the order to retire at the double the lack of food and water had its affect, and the writer felt so weak after going 100 yards that he had to lie down and wait until he got his breath. The casualties for the day were very few. Subseqently Private Hopkins was present at the capture of General Cronje, the Battles of Osfontein, Poplar Grove, and Abraham's Kraal, the entry into Bloemfontein, the Battles of Karce, Brandfort, and the Vet River. Captain George Osborne, of Foxlowe, and once Captain of the Mounted Rifles at Queanbeyan, joined the regiment at Bloomfontein, and was put in charge of the company Hopkins was in. The writer was present at the engagement at Klip River and the entry into Johannesburg. At Johannesburg Captain Osborne had to leave through sickness. The entry into Pretoria was the next event, and then Private Hopkins assisted in the engagement at Diamond Hills. Afterwards Private Hopkins' Company was engaged in the pursuit of De Wet, and in an engagement with that Commandant's troops the writer's corps had more casualties than in any of the previous engagements. At the time of despatching the letter the force was still after De Wet. Private Hopkins mentions that out of 100 Mounted Rifles that left Sydney in the first contingent only 35 at the time of writing remained at the front.